This was started by Mony Suriany, a yoga devotee, as a Bikram-inspired studio. The passion is share the wonderful joy of yoga as the key the key to leading an inspiring life, together to find balance, connect with like-minded others and ease lives through many paths of yoga. Over a period of 12 years, the studio grew not just a certified bikram yoga studio, but expanded into a few brands to include other styles of yoga, yoga merchandises and organic lifestyle products. It’s a one-stop yoga studio with three rooms located five minutes from Ubud Village. Offering classes, retreat, workshop, holiday and training for yoga enthusiasts and newbie. The Retreat Café and Wine Bar is a relaxed café with simple recipes featuring local fresh fruits and high-nutrition plant-based foods. 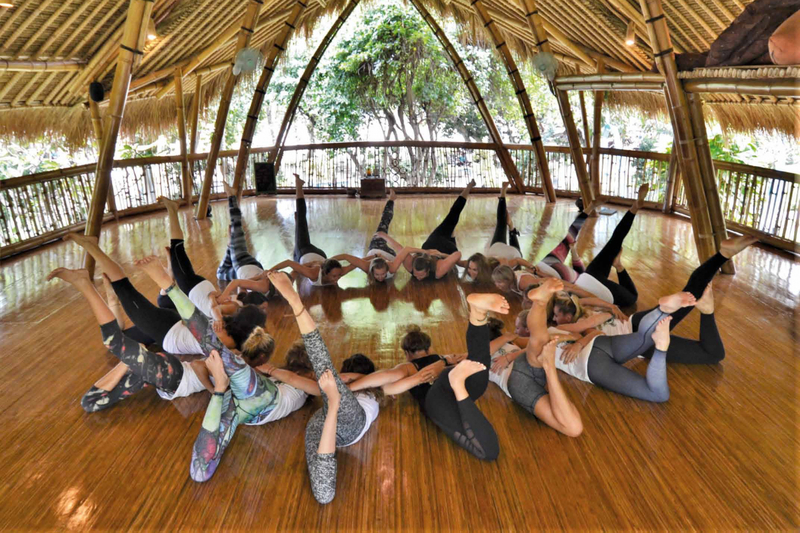 This beachfront bamboo yoga studio is located metres from Sanur’s white-sand beach. Not just a yoga classes, the studio are also provided a place to spending a week of rejuvenating treatments to nourish the body and soul and for practitioner who are looking for high quality Yoga Alliance accredited yoga teacher training. The studio offers three or four daily classes in a large variety of styles, with both local and foreign teachers, for individuals and groups. Classes can be customised to meet guests’ needs. Bringing a mission to nature and the local community, the studio is made of 100 percent eco-friendly bamboo and works with foundations such as the Jodie O’Shea Orphanage, Sari Hati Schools, Sea Shepherd Conservation Society and The Lighthouse Bali. A rustic, spiritual space set amid terraced rice paddies in Ubud, The Yoga Barn creates an inviting, spirit-inspired environment, with its main focus on teacher and student-guest needs. The mission has always been to provide a relaxed and inspiring environment for the nourishment of body, mind and soul through daily classes, workshops and retreats in yoga, dance, meditation, Ayurveda, detox, breathwork, various healing modalities and more. Much thought goes into the diverse programming and the teaching team strive to provide classes and other events to the highest quality, taught with deep knowledge, life experience and sincerity. Soulbox Jakarta is a revolutionary new urban fitness centre that offers a choice of alternative programmes, such as AntiGravity, Reflex, Bootcamp and SoulBarre, as well as hip varieties of yoga, such as Ashtanga, Vinyasa and Jivamukti. The concept is a creative, flexible and ever-evolving fitness space to execute the latest in cutting-edge programs and workouts, as the design are open multi-function spaces. The mission is to provide the busy, social modern urbanite lifestyle with a wellness solution that’s both convenient and stylish. A complete studio offering Bikram, Sveda Yoga, Acro Yoga, Ashtanga, Vinyasa, Hatha, Kids Yoga, Prenatal Yoga and more, Union Yoga offers ambiance for body and soul. Founded by Chu Chu Liu, a Bikram enthusiast, and Fajar Putra, an Acro Yoga practitioner, it’s designed like a home with a large room and a beautiful bathroom. “We wanted to make this studio like a half spa, so that you feel at peace, comfortable,” Chu Chu explains. Initiating regular classes every hour, Union Yoga creates a friendly for everyone who wants to learn yoga. In 2002, five good friends – Afi Shamara, Amalia Wirjono, Anita Boentarman, Dian Mediana and Tami Arifin – inaugurated a regular yoga class, taught by a private instructor in Amalia’s house. As time passed by, their dream were getting bigger of creating a yoga studio where everyone are welcome to learn as a beginner or advanced students. In 2003, Rumah Yoga became the first fully equipped yoga studio in Jakarta, offering many levels and workshops with the most qualified instructors, in an intimate and nurturing environment.